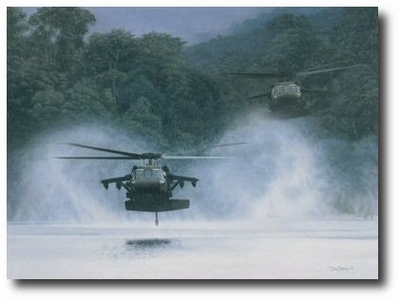 Images size: 18" x 25"
The Sikorsky UH-60 "Blackhawk" is the world's finest medium transport helicopter, and the primary instrument for US Airborne assault missions. its exceptional performance has gained it a well-earned reputation for unprecedented reliability in various multi-operational modes. 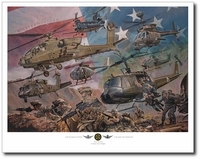 Reproduced on 100 lb Museum Quality Archival Stock and each print of "The River Hawks" is individually inspected and signed by the artist.